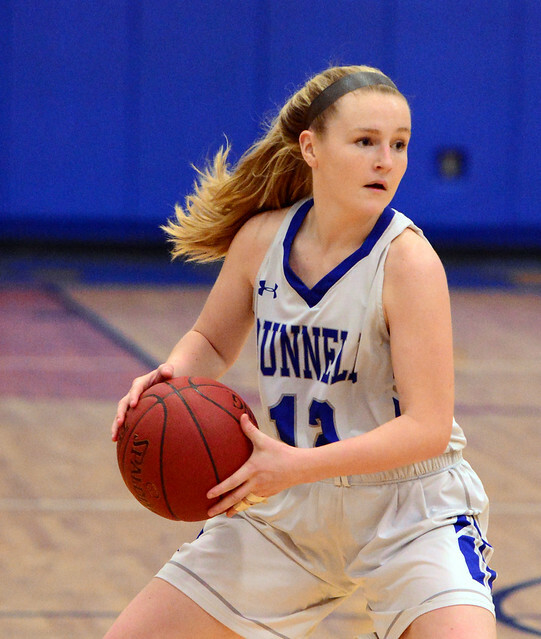 STRATFORD—This time around, the Bunnell girls basketball team wasn’t going to let a big second-half lead slip away. The Bulldogs used a torrid-shooting first half to build a 38-point halftime lead against arch-rival Stratford, and then tried to cruise through a second half en route to its fourth win of the season. The visiting Red Devils, however, stormed back to get within 14 mid-way through the fourth quarter before the Bulldogs went back to its starters to post a 59-39 win inside the Bunnell Gym on Tuesday night. It was the Bulldogs’ second win over the Red Devils this season, a year in which the Bunnell group hasn’t quite reached its full potential. Bunnell raced out to an 11-0 lead before Stratford even got on the board. By the end of the first quarter, it was 20-6, Bulldogs. The hosts then held Stratford to just one basket in the second quarter while throwing up 26 more points to take a 46-8 lead at the break. Jasmine St. Clair added 13 points to the winning effort, 11 of which came in the first half. All the Bulldogs played a key role in the first half, including Kristin Zack, who had all six of her points, and Adrianna DeBernado, who netted all five of hers. Brianna Ramos, Maura Kelly and Aly Wright all scored in the first half, too. The Bulldogs were only called for one foul in the first half, as well. Stratford, which was led by Abby Anka’s 15 points, was playing its third game in five days, with just one practice, and appeared fatigued from the get-go. The Red Devils were also without a starter Keryna Upchurch (hand injury) and lost another, Lyna Upchurch, when she banged her head off the floor in the second quarter. In fact, in the second half, Stratford stormed back, but the hole was just too big. They scored the first eight points of the second half and chipped away until the Bunnell lead was down to 51-37 with 3:54 to play. The Red Devils also had a possession where it could have cut the lead to 12, as well. After that, Eleazer brought back in four of her starters to make sure the game didn’t slip away as it had against Immaculate, when a 17-point lead turned into a four-point loss last week. Discenza had left her team in the locker room for a heart-to-heart before the start of the third quarter. “We just didn’t wake up,” the first-year coach said. Anka and her teammates, however, pledged to make the second half a different story. Julia Torreso added eight points for Stratford, which dropped to 6-12 with two games remaining. 3-pointers: S—Anka; B–Trovarelli, St. Clair; Team Records: Stratford 6-12, Bunnell 4-14.